Columbia road flower market is a street flower market located in East London. The market´s activity started in 1869 as a covered food market. 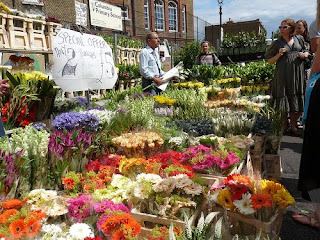 Huguenots introduced interest and demand for cut flowers in East London population. Initially, the market was on Saturdays, but it was moved to Sundays to accomodate the needs of local jewish traders. Nowadays, the market opens on Sundays from 8 am to 2 pm. A lot of the flower sellers grow their own plants or import flowers from around the world. You also find small art galleries, cup cake shops, vintage clothes stores, English and Italian delis, garden and antique shops. There is also a wealth of great pubs, cafes and restaurants. A great experience for a sunny Sunday.